Not a lot to report. 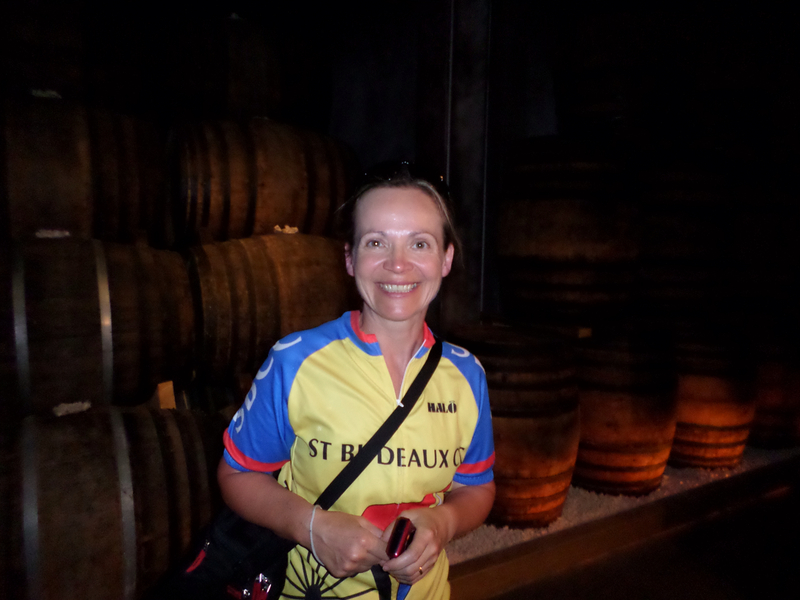 Took a day off the bike and walked in to Cognac for lunch. Returned to find the tree surgeon hacking branches off the tree in the next pitch to ours. So WE HAD TO MOVE THE TENT. I am still suffering the trauma, particularly since we are going tomorrow and will only have been here for 3 nights, thereby wiping out most of the advantage of a multi-day stay. I arose to find that the house elves (i.e. S) had been busy overnight, with practically the whole contents of our panniers festooned across a makeshift washing line and tent - today we will have clean, dry clothes! 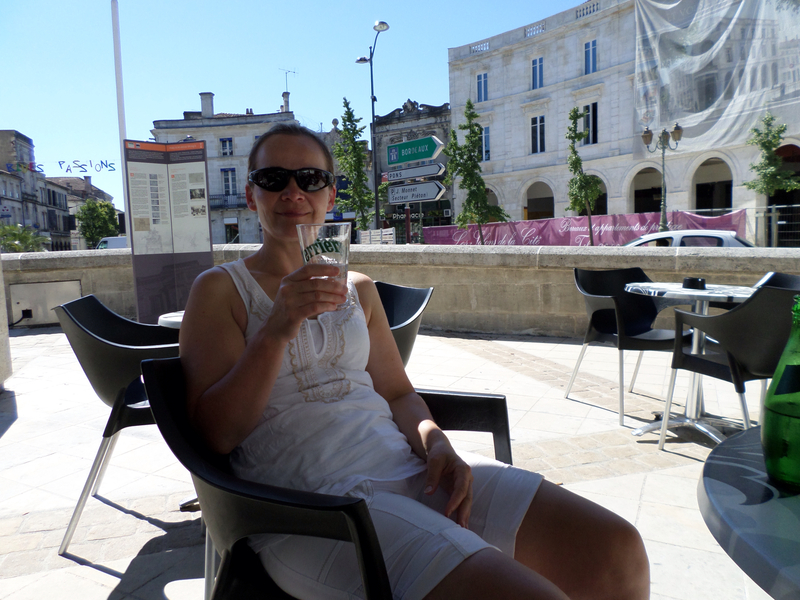 Today we took a leisurely ride along the R. Charentes to Jarnac, which is the home of Courvoisier Cognac. Now, if you are a regular reader you will know from last year that S cannot be restrained when the opportunity arises to lay a stack of wonga on some luxury beverage or other, and today was no exception (see crazed look at prospect below) as we took the tour of the Courvoisier distillery. So, armed with the knowledge of double distilled and oak-aged liquid gold, we emerged into the marketing vestibule for the degustation. Arrayed in plinths were the various grades of Cognac, with 'VS' and 'VSOP' being 'OK for cocktails' according to our host. On hearing this I thought it best to withhold my query of "do you have any 'V' . . ." as possibly belaying a lack of sophistication, or impecuniousness on my part. I needn't have worried, S kept the flag flying by being the only person on the tour to splash the cash on a bottle of anything, and that being 'XO' (don't ask). So now we have a bottle of premium cru which we can't drink because I only brought a couple of enamel mugs with us! There is no other way to describe it, the water in the campsite tastes like TCP. I queried this with the receptionist who replied 'I don't know, I never drink it'. From now on S will be despatched to the supermarche to add water carrying duties to her list of camping tasks. On the plus side, at least my leg wound is re-sterilised after every shower. To update you on yesterday evening, we arrived at Quimper in time for the Breton cultural festival which entailed lots of wearing of traditional costume, playing of bagpipes, dancing in a big tent & etc. We watched the parade, albeit with a restricted view, and consumed the first moules et frites of the tour. 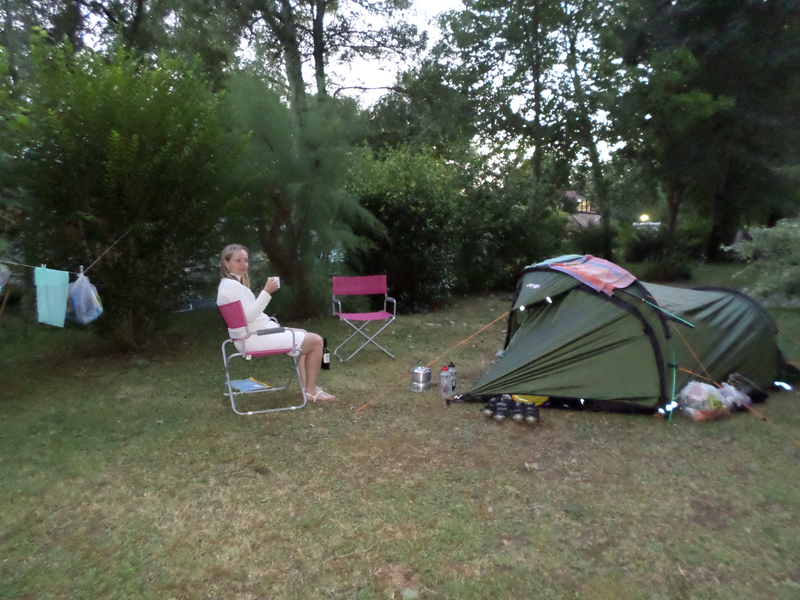 We had an early start in the morning, the 6.20 train to Saintes, so turned in accordingly. 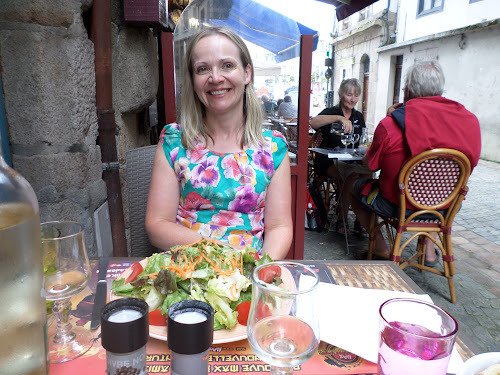 Having done this last year I was confident of a seamless transition onto the train at Quimper and thence an un-interrupted journey along the coast down south when I could catch up on some sleep . . . already, you know that it wasn't the case. We got to the station sans problem but, of course, the train was on a distant platform and, this being France, there is no SENDA compliance . . . but there is a narrow steel ramp down one side of the steps to the underpass . . . So, to save me the bother of removing panniers I elect to manoeuvre my laden bike down it with judicious use of braking to retard its progress, not factoring in the much increased weight compared to previous trips and complete lack of friction between tyres and ramp which straightaway took on the function of a bobsleigh run and me resembling the last poor idiot who waits too long to get in the back. Anyway, to cut a painful story short, after some unseemly wrestling, rear wheel detaching from dropouts, near total disaster, and unexpected shark attack I decided to take off the panniers and carry the bike . . .
H: 'yes' . . . then silence, not even swearing, a very bad sign. S knows to keep quiet at this point.
. . . the nice lady on the train gave me an antiseptic wipe with which I set about scrubbing out the chain oil and grit so I wouldn't be left with a permanent tattoo, and patched it up with some plasters which have been languishing in my first aid kit for decades. So, as long as gangrene doesn't set in I will be fine. 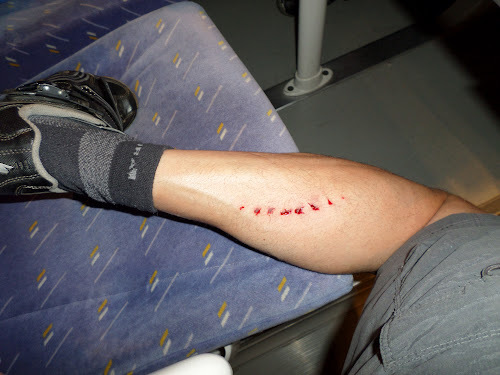 The next hurdle was the unexpected change of train at Nantes. I had specifically booked the 6.30 am (very bloody early) because it is straight through to Bordeaux and we wouldn't have to change . . . NOT SO, the nice train lady informed me, 'vous devez changer a Nantes'. So change we did, but at least it was on the same platform, so no chance of another shark attack! The rest of the journey was uneventful, and we alighted at Saintes where we partook of le dejeuner on the bank of the Charentes. 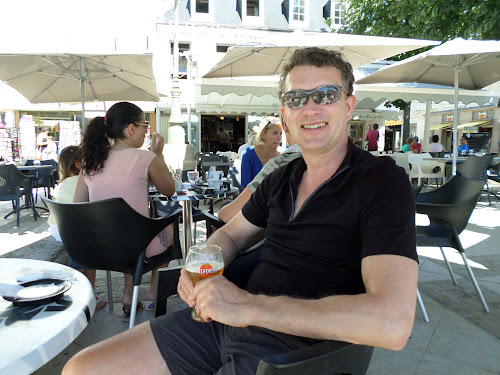 Onward then through the heart of Cognac country - Remy, Camus, etc.- to Cognac itself, where we now reside at the Manicipaux Camping Cognac on the banks of the Charentes, partaking of the inevitable vin rouge apres le diner. It rained . . .
We awoke le matin to the sound of it hosing it down as the wonderful weather of the last few weeks finally broke ON OUR FIRST NIGHT UNDER CANVAS. No matter, we are made of stern stuff and the pain au chocolat purchased the previous day from Lidl were given the Chez Evans treatment - stuffed with banana slices and warmed in the Trangia. Suitably fortified we broke camp just as the sun came out . . . but it was not to last! H knows how to show a girl a good time . 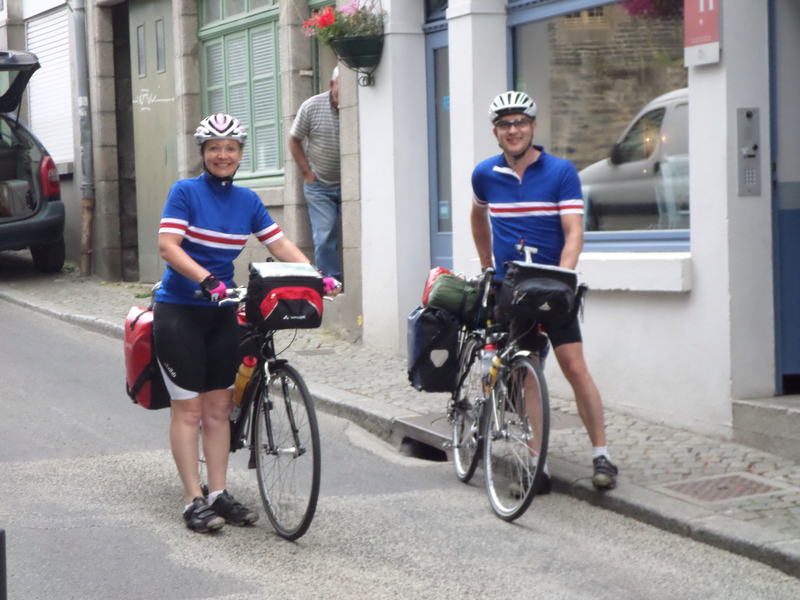 . .
We had a relatively short journey to Quimper in prospect . . . piece of p*** I cajoled S, and indeed the initial part was relatively straightforward . . . until the rains came. Clearly there were large black clouds in the sky, and the weather forecast had threatened thunderstorms, but then the wind started to whip up something evil and the rain was falling like marbles . . . so first stop under a tree 'until it passes over'. Off we go again and make about a mile (we are only about 5 miles from Quimper at this point) and another squall blows in. Knowing that S suffers terribly in the wet ( and the cold, and the heat for that matter), I cheered her up with the prospect of a lunch stop at an idyllic country spot . 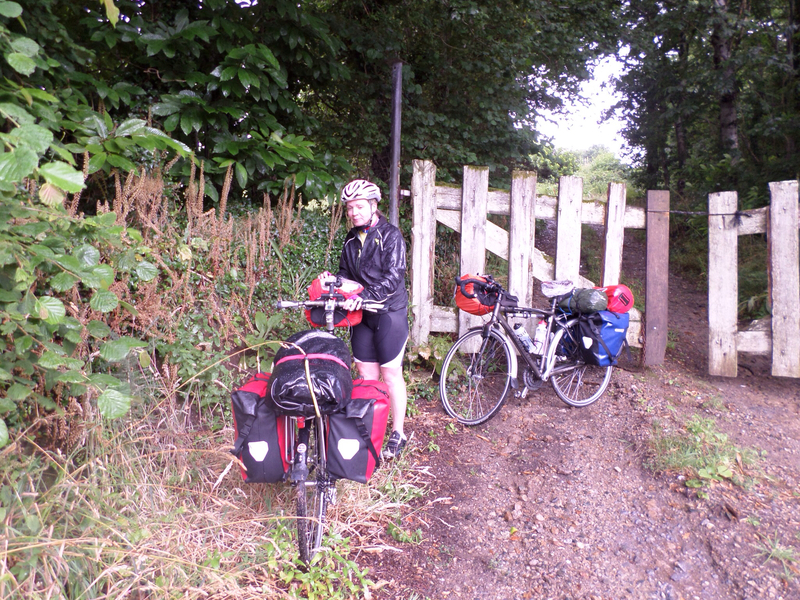 . .
Suitably fortified after the standard fare of yesterday's baguette, Camambert and tomato, we set off again . . . and this time the heavens opened upon us verily like a biblical flood. Once more under the roadside foliage with the floodwaters threatening to wash us to oblivion we waited out the storm, this time the whole shebang with thunder and lightning. The rain eased eventually and we coasted in to Quimper (brakes being practically inoperative) down the dual carriageway after a bit of mis-navigation due to rain running into my eyes, and eventually to the Ibis hotel (thank God in Heaven that this was a non-camping night) where I set S her various tasks while I repaired to the bar . 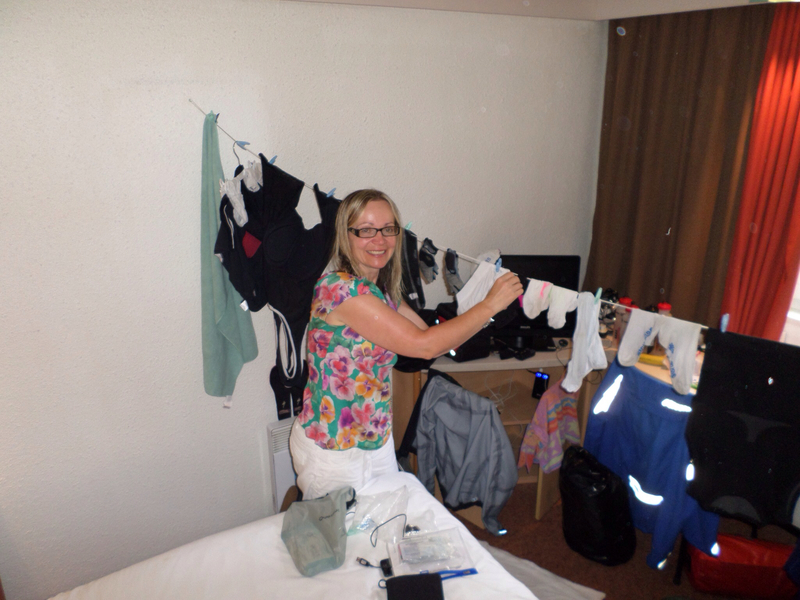 . .
Having coddled S with the first night in a hotel we set off from Morlaix with the prospect of a first night under canvas looming. Bedecked in patriotic colours which did double duty whether en France or in Britain, the first stop was the patisserie for fortification and L'Hotel d'Europe cafe so as not to curse SBCC by not stopping. 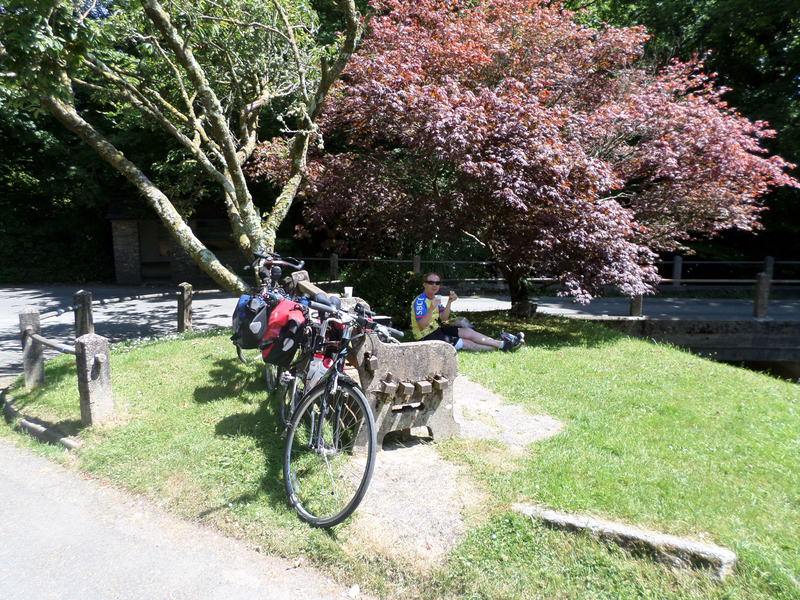 Today was only a short one of 35 miles, however, I omitted to tell S that is was practically all uphill to the 'highest point in Brittany' (well, it might have been). And then, so as not to curse SBCC, we simply had to pay a visit to the church at Montaigne de Mont St Michel to take in the view. Lunch was a hastily scoffed baguette, tomato and camambert, and we even forewent the usual half bottle of red because the mist was down and it was raining - probably for the first time in weeks! We arrive at the municipal campsite at Pont Coblant, which I had booked the previous day using my best French, having stopped for supplies at the Lidl in Pleyben (some things don't change even on vacances). The trouble with Lidl, though, is that not everything is purchasable in small portions, so my veggie curry necessitated buying three onions, two of which will add to the load tomorrow. Despite pitching in the rain the campsite is tres bon, on the banks of the Nantes-Brest canal and only cost €9! 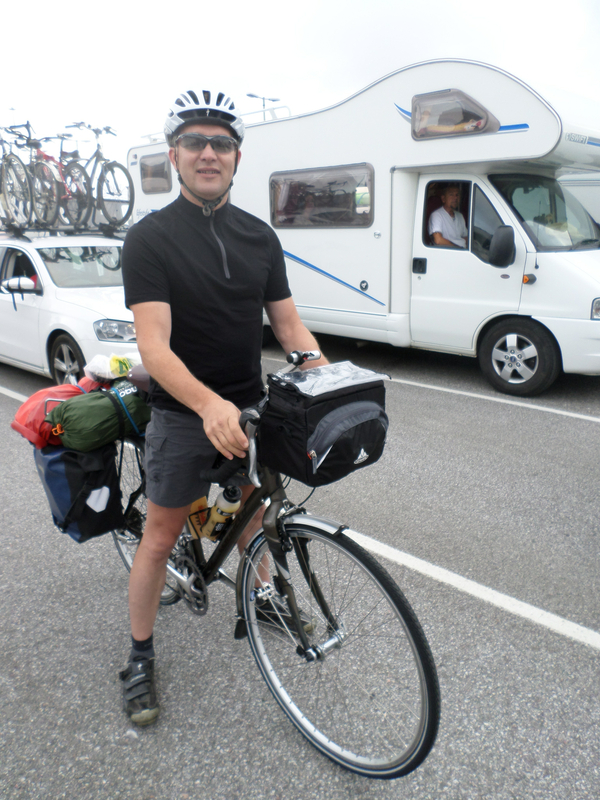 Once again we find ourselves at Millbay ferry terminal at 7 am, ready to embark on the annual France en velo. This time, overladen with camping gear and consequently short on undies and clothes in general. Waved off by the neighbours, who we happened to pass as they were having an early morning run around the Hoe (so madness is endemic in Peverell village). No sooner had I boarded the ferry than I bumped into Tim O'Hare, off for the summer with family in tow; and then Matthew Watkinson - it was like being at work - and I'm sure I spotted one of the 'girls' from Loafers sandwich bar! The sun was shining in Roscoff - it better bloody be after all the nice weather we've had while I've been at work - and the usual trip to Morlaix went, well, as usual. Once more into the Hotel St Melaine such that the proprietors now welcome us back as regulars. This time we resolve to go to a different restaurant, however . . . report on my return . . .
Now, the hotel St Melaine has a key code access lock on the door, the code for which was entrusted to S because 'I'm (i.e. S) good with numbers'. Needless to say, on our return the code '5260' was inoperative. Luckily, however, two other guests were leaving so I took the opportunity to compare our post-its with the scribbled code - theirs was '0925'. The more astute of you will have already twigged that S was holding the paper upside down when she memorised the numbers, 'ca va' as they say. Anyway, we still have a bed for the night after return from the restaurant. Having tried somewhere different it will be back to La Dolce Vita for a pasta feast next time. 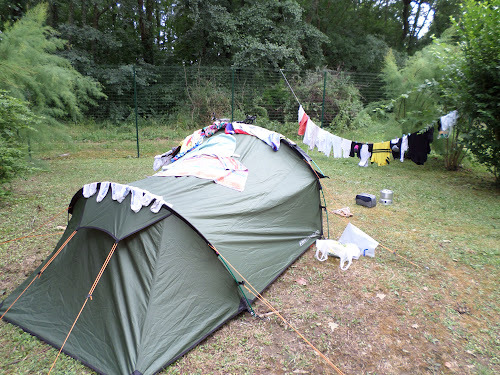 In preparation for the 2013 'tour', which will now include nights under canvas, I resolved to take S on practice camping excursions to idyllic spots in Cornwall where I could iron out any practical difficulties vis a vis 'survival in the wild'. So, having made a lightning raid on Go Outdoors and purchased the necessary equipment we loaded up the bikes and set forth to Siblyback lake near Minions, forgetting that, despite having had many a leisurely ride to Minions in the past, it does boast to be the highest point in Cornwall and the bikes were now fully loaded with the paraphernalia for a night under the stars, plus a litre of tetra-packed Spanish Red (weight saving measure). 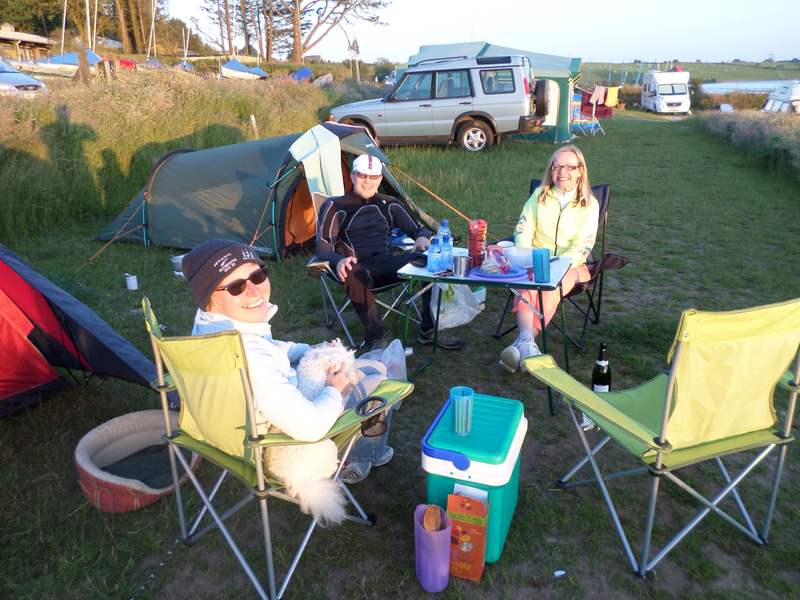 Nevertheless, got there ok and met the neighbours on the adjacent pitch who, having driven, had brought a camping table and four chairs . . . but no regulator for their gas cooker. 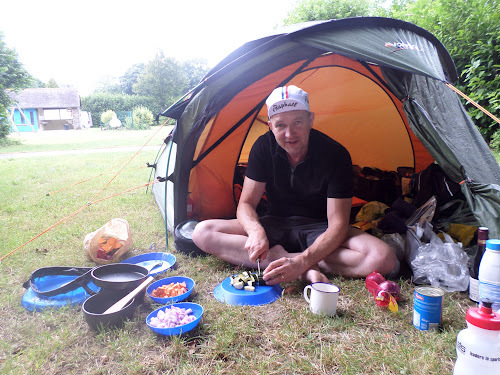 So it was with great pride that the Trangia camping set was twice christened, once with Uncle Bens rapid cook rice, and second with a tasty veggie curry made by John and Debs from next door - two lessons learned, double check before you go, and you can cook a decent meal al fresco from scratch . . . camping virgins no longer. The next excursion was more glamping than camping, given that we stayed with my folks in a 6 berth caravan complete with microwave, tv and fridge. Nevertheless, this still required transportation of sleeping bags and so forth, and we took the long route to Polzeath so S was contemplating rescue at Wadebridge - I convinced her otherwise after a fortifying cup of tea, however. This was the trip that took in the 'village that time forgot' described in the last post, but as an addendum to this the red wine at lunch turned out to be not such a good idea in the blistering heat as we rode back from Plusha on the (ironically) club TT route. Leaving this, and thence onto the Sun beaten A388 until the 'best tasting can of coke I ever had' at the petrol station in Hatt. So, to today and deja vu . . . the sun is shining and temperatures topping 30; the camping gear Is out; once again to Polzeath; I cycle there in record time . . . and S takes the car. 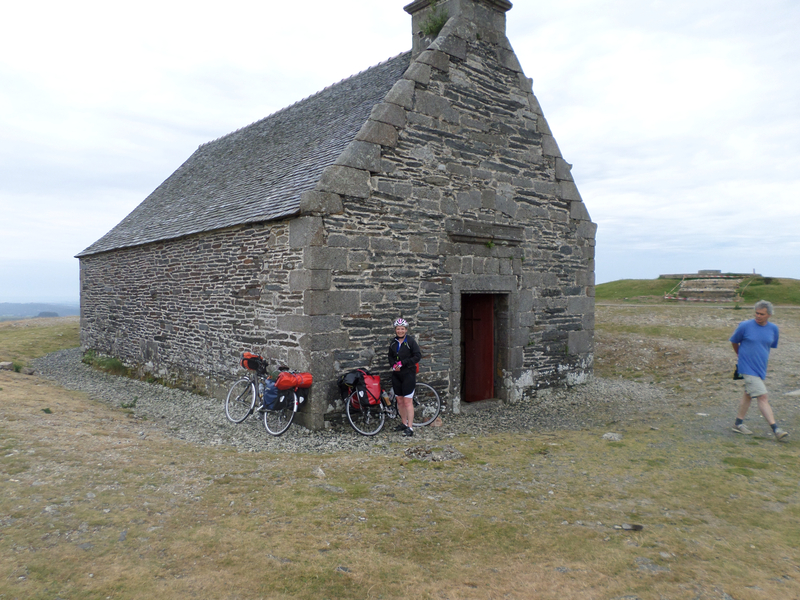 One of the great things about cycling is that you visit places that you would never normally see. The English countryside is packed full of picturesque villages in which time has seemingly stood still. It's not entirely true of course because there is no longer the local pub, shop, post office etc. . in most cases, and the original residents can no longer afford the price of the homes. 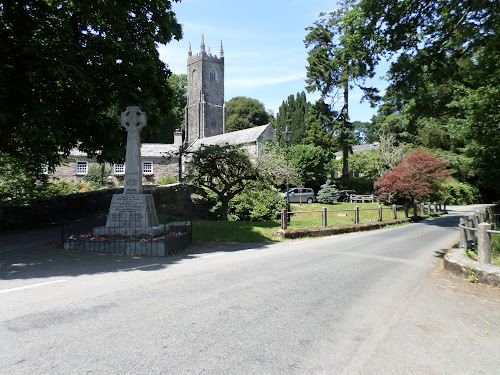 But the semblance of timelessness remains, and it was this that presented itself as we rolled down the hill into Altarnun on the edge of Bodmin Moor last Sunday. An old-fashioned summer had finally arrived with high 20s heat to remind us of bike rides of our youth; the panniers were packed with Camambert-filled baguettes and red wine. 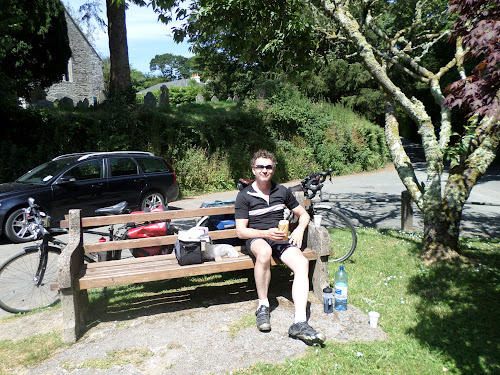 Riding back from Polzeath we were on the lookout for a half-remembered bench from the outward leg, so passed many a likely lunchtime spot before descending the tree-hemmed lane into a tableau of village green betwixt church and bubbling brook, with a bench and shady tree as if by order. The old gravestones in the churchyard bore witness to the inhabitants who either died before 20 or lived into their 80s, almost none in-between . . . except those on the cenotaph. I wonder if it really exists.